First owner. Maashahallah UN-accidented. GV Executivw - Top of the line. Power steering. Power windoes. A/c heater. Spoilers. Fog lights. New tyres. Engine in perfect purring condition. Company maintained car. CD player, USB readable. Pioneer surround music system.Owned by a doctor, Key-less entry. Alarm. Rear wiper. 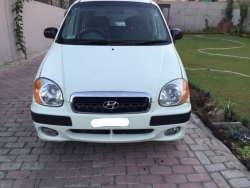 The buyer will be completely satisfied with the performance of the car. Would make the new owner very happy. Bought a new car hence selling this one off. Suggestion: Must see and then place your offer..you will not be disappointed! Excellent Condition. The car has CNG Kit fitted. It has Air conditioner and remote locking system. Contact on 03008916836 for further details. 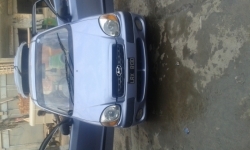 Want to sale my Lovely Hyundai Santro Plus 2001 Model,Car is in Excellent condition,No Work Required,Painted Body,Good Suspension,Smooth Drive,Chilled AC,All Good,Price Negotiable,Only Serious Buyers can be Entertained,Original File,Life Time Token Paid !Contact #(0.3.2.3.1.4.2.5.2.5.0) ! Santro Lovers. very neat and clean car. totally driven by lady teacher. excellent fully powerd engine. new tyres. Urgent Sale.